To Cite: Poursalehan S, Nesioonpour S, Akhondzadeh R, Mokmeli S. The Effect of Low-Level Laser on Postoperative Pain After Elective Cesarean Section, Anesth Pain Med. Online ahead of Print ; 8(6):e84195. doi: 10.5812/aapm.84195. Background: Postoperative pain is one of the major concerns about a cesarean in pregnant women that can lead to serious complications and delayed recovery for patients. Objectives: The objective is to investigate the effect of low power laser on acute pain after elective cesarean. Methods: In this randomized, double-blind clinical trial, 80 candidates for an elective cesarean were divided randomly into two groups, control and laser. The type of surgery was the same for both groups, which contained the spinal anesthesia technique. At the end of surgery, the surgical incision in patients who were treated with laser, (GaAlAs: 804 nm and GaAlInp: 650 nm) was irradiated by laser. The control group also received laser off by the same method. Patients were monitored for 24 hours to assess the severity of postoperative pain by VAS, the first request for analgesic and the total consumption of analgesic. Results: The results demonstrated significant reduction of pain in the laser group 1, 4, 8, 12, 16, 24 hours after surgery, compared with the control group (P value < 0.05). Additionally, the average of total received analgesic in the group laser was less than the controls (P value = 0.006). The first request for analgesic in the laser received group was significantly longer than the controls (P value = 0.005). Conclusions: Low power laser therapy is a good method to reduce postoperative pain due to the fact that it is a safe and non-invasive method which is also accepted by patients. Postoperative pain is one of the major concerns regarding a cesarean for pregnant women (1). In addition to developing the fear in patients to consent the surgery, pain also impacts their spirits adversely (2). The pain after cesarean delivery affects the mother's ability to feed and care for the baby, which limits her abilities. Since the risk of thromboembolism increases during the pregnancy, lack of mobility, due to pain, increases the possibility of thromboembolism for them. Chronic pain is known as a common complication after the cesarean section; however, studies have shown that 12.3% of patients experience pain six months after a cesarean. Experience of severe acute pain, especially during the first 24 hours after a cesarean, can be the cause of persistent pain and postpartum depression at eight weeks after that (3). Therefore, optimal perioperative pain management is of utmost importance and contributes to greater patient satisfaction, fewer adverse events, shorter hospital stays, and reduction in health care costs (4). Currently, there are several methods to relieve pain after cesarean. The most common method of analgesics administration after surgery is applying a multi-modal approach using opioids and non-steroidal anti-inflammatory drugs, however, the use of opiates has side effects such as respiratory depression, nausea and vomiting, urinary retention and constipation. In addition, intrathecal or epidural injection of opioids, acupuncture, and patient controlled analgesia have been used to relieve pain after the surgery (5, 6). In the present century, laser irradiation on the surgical field is one of the methods, which is used to prevent and reduce post-operative pain (7). Low level laser therapy (LLLT) was approved by the Food and Drug Administration (FDA) for the treatment of pain in 2002 (8). Low level laser therapy is a treatment method, which uses the low intensity light in the range of 540 - 830 nm. Light emitted by the laser does not cause heat generation and is used to treat pain and wound healing. Therapeutic effects of this method are achieved by the photochemical reactions, which lead to change in the permeability of cell membrane, increase the mRNA synthesis, and also raise the cell proliferation (9). LLLT shows the greatest potential to prevent tissue death and stimulates tissue regeneration in a wide range of diseases in neurology (10), ophthalmology (11), cardiology (12), and otorhinolaryngology (13). Many studies have found that low level laser can stimulate the respiratory cycle in the mitochondria and induces the production of adenosine triphosphate (ATP), which further reduces pain and edema (14, 15). LLLT has been effective to reduce the pain, inflammation, and edema for orthopedic injuries and degenerative diseases, for the treatment of sport injuries and musculoskeletal diseases (16, 17), for reducing postoperative pain after tibial fracture operation (18), for reducing the pain after surgery of Breast augmentation (8), for reduction of the size of keloid scar (15), and also for prevention of oral mucositis after cancer treatment (19). The purpose of this study was to evaluate the effect of low level laser on postoperative pain after elective caesarean section. This study was a prospective, double-blind clinical trial that was conducted during the period of 2014 - 2013. 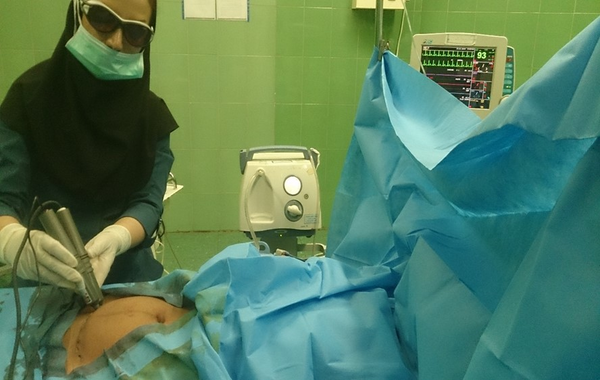 Groups of patients were selected among the admitted patients for elective cesarean from Imam Khomeini hospital in Ahvaz, Iran. Setting the power at 80% and the values for α, β, Zα, and Zβ at 0.05, 0.2, 1.96, and 0.84, respectively, the sample size was calculated to include 40 subjects in each of the case and control groups. After approval of the Ethics Committee of Ahvaz Jundishapur University of Medical Sciences (ajums.rec.1392.40) and written consent was taken from 80 pregnant women between 40 - 18 years, women with their first or second pregnancy and the American Society of Anesthesiologists (ASA) classes I and II were candidates for elective cesarean and were selected as the inclusion criteria of study. The subjects were randomly divided into two groups of 40 individuals for laser and controlled groups through a computer - generated list of random numbers. The exclusion criteria of the study included individuals determined as the patients with previous classical incision, malignancy, benign tumors with the possibility to become malignant, sensitivity to light such as lupus, history of epilepsy or seizure, the patient's refusal of spinal anesthesia, elevated ICP, coagulopathy, infection of the skin or soft tissue around the insertion of the needle, and peripheral neuropathy of lower limb. After arriving to the operating room, patients received 10 mL/kg Ringer's lactate solution. Monitoring equipment employed were electrocardiogram, pulse oximetry, and sphygmomanometer; spinal anesthesia was done with 12 mg bupivacaine 0.5% (Astrazeneca Co. Germany) in the sitting position at the L4 - L5 space with midline technique. After ensuring the neuroxial block with the lack of sense with the tip of a needle at dermatome T4, the patients were operated as by Pfannenstiel incision. During operation, at 5 minute intervals, systolic and diastolic blood pressure, oxygen saturation, and heart rate were monitored. The treatment were done in the surgery room after the end of surgery and before the bandage. Laser group was treated with the combination of IR and red lasers (PLP-IR 808 nm - 200 mW, PLP-R 650 nm - 100 mW). For the control group, lasers were set to “off” during the treatment as placebo. Lasers were designed and manufactured by Canadian optic and laser center (COL Center). The power density for red laser was 0.1 W/cm2 and for IR laser was 0.2 W/cm2 (Figures 1 and 2). 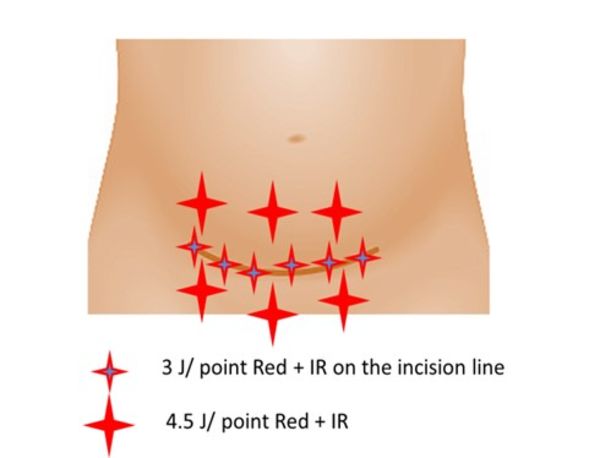 The incisions were treated by the red laser, 1 J/cm2 for 10 seconds, and IR laser, 2 J/cm2 for 10 seconds. The total combination dose was 3 J/cm2 (1 J Red + 2 J IR) on the surgical suture. The size of the incisions was between 7 - 10 cm2, therefore, the total energy was between 21 - 30 J, depending on the size of the incision line. The surrounding tissue was treated with the same combination of lasers with the interval of 2 cm, three points above and three points below the suture and each point’s area was equal 1 cm2. Each point was treated for 15 seconds by Red and IR. The total dose for each point was 4.5 J/cm2 (3 J IR + 1.5 J Red), and the total energy was 27 J. The patients and anesthesia resident who completed the questionnaires were blinded to the patient groups and did not know the study groups. Only the operator of the LLL was aware of the study group. Considering the end of anesthesia, as the onset of pain through Visual Analogue Scale (VAS), a measure, which is considered the least pain equal to zero and the worst imaginable pain of 10, were examined at 1, 4, 8, 12, 16, and 24 hours and they received intravenous Pethidine 0.3 mg/kg in the presence of pain with VAS equal to three or greater than that. The severity of postoperative pain, first request of tranquilizer, and total consumed Pethidine after 24 hours were recorded in the questionnaire by the assistant of anesthesia who didn’t know about patient groups. Side effects including nausea, vomiting, dizziness, and hypotension were also studied at stated hours. Data were reported as the mean ± standard deviation (SD). In order to compare the groups after analyzing the normal distribution and homogeneity of variances, the Independent sample t-test, repeated measure test, and Bonferroni post hoc test were applied. Significant level of data was considered as P < 0.05. Statistical analyses were performed using SPSS software (version 16). In this study, 80 patients were divided into two groups of laser and control. According to the results in Table 1, the two groups were similar in terms of demographic characteristics (age, weight, and height), and the duration of surgery (46.7 ± 3.4 and 47.7 ± 5.59 minutes; P = 0.71) did not differ significantly from each other. b P < 0.05 shows significant difference between groups. Postoperative pain severity was achieved by VAS scores based on criteria at different periods in Table 2. Due to the results, post-operative pain severity decreased significantly in the laser group based on the VAS criteria at 4, 6, 8, 12, 16, and 24 hours after the operation (P < 0.05). b Significant difference between groups (P < 0.05). According to the results of Table 3, the laser group needed the tranquilizer later than the control; there was a significant difference between two groups (P < 0.005). Based on the results of Table 4, the average of total tranquilizer (analgesic) in the group receiving the laser was significantly less than the control group (P = 0.006). The side effects of nausea, vomiting, hypotension, and dizziness weren’t also observed in any of the two groups. In this study, the effect of GaAlAs laser, with wavelength of 804 nm and GaAllnp with wave length of 650 nm were examined on the post-operative pain of cesarean. The results showed a significant reduction of pain in the 1, 4, 8, 12, 16 and 24 hours after the operation. In the research of Moor and colleagues GaAlAs laser with wavelength of 830 nm for 6 - 8 minutes after the operation of cholecystochetomy reduced the pain after 8, 12, 24, and 48 hours of the operation significantly; however, it wasn’t significant after one and four hours (20). In the research of Kreisler and colleagues, in 2004 on 52 patients who were treated by endodontic surgery, it was found out that GaAlAs laser, with the wavelength of 809 nm, reduced the pain in the place of surgery the after first 7 days of operation, however, the pain reduction was significant only one day after the surgery (P value = 0.04) while pain reduced in next days, however, the difference wasn’t significant (21). Bjordal and colleagues reported in 2008 that low power laser irradiation GaAlAS, with the dose of 904 nm to the lateral elbow tendon directly, reduced the pain and improves the ability to move patients clearly (22). Hegadus and colleagues, in 2009, reported that laser irradiation (wavelength 830 nm; continuous wave; and power, 50 mW) in patients with osteoarthritis of the knee led to reduce pain and improve joint movement (16). Jackson and colleagues, in 2009, using the low power laser with 360 - 640 nm wavelengths for four minutes at the initiation and the end of breast augmentation operation and its repetition 24 hours and one week after by the same protocol and follow up of patients after 7, 14, 21, and 24 hours, demonstrated that VAS level reduced at the mentioned times, however, the differences were significant only in the first 24 hours rather than control group (P value = 0.001). The analgesics used in the first 24 hours and one week later was significantly reduced in laser group (8). Ribeiro et al. in 2011, reported that using a GaAlAS laser with a wavelength of 660 nm reduced the postoperative pain in patients with oral leukoplakia and the recurrence rate after surgery was lower in the group receiving laser compared to controls (23). In one study, in 2014, using GaAlAs laser with wavelength of 808 nm and GaAllnp laser with wavelength of 650 nm, demonstrated significant reduction of postoperative pain after Tibial fracture surgery at 2, 4, 8, 12, and 24 hours after surgery (18). The results also showed that the first request time of analgesic, in the group who underwent laser was significantly longer than the control group (P < = 0.05). Additionally, the average of total analgesic in the group receiving the laser was significantly lower than the control group (P ≤ 0.05). These finding are matched with the results of studies that suggest using the LLLT, which reduces the consumption of analgesics at the postoperative period, reduces the edema and inflammation after surgery, and speeds up the healing process (24). Researches show that LLLT can cause the painless by reducing the PGE2 (21, 22), preventing the production of stimulating compounds and adjusting the inflammation process, stimulating the release of exogenous endorphin, and altering excitation and nerve conduction in peripheral nerves (25). The results of this study showed that GaAlAs laser, with the wave length of 804 and GaAlInp laser and with wavelength of 650 nm can reduce postoperative pain and analgesic consumption after the operation. The side effects of such respiratory depression, skin reactions, analgesic nephropathy, and ulcer peptic have been seen in other forms of analgesia consumption methods, are not seen in LLLT. Finally, it is recommended that further studies should be conducted about using the LLLT in anesthesiology, due to the fact that LLL is a safe, non-invasive, and accepted method by patients. Authors' Contribution: Study concept and design: Sholeh Nesioonpour and Soheila Mokmeli. Analysis and interpretation of data: Sholeh Nesioonpour, Sarah Poursalehan. Manuscript preparation: Sara Poursalehan, Reza Akhondzadeh. Collection of data: Sara Poursalehan. Critical revision: Sholeh Nesioonpour. Ethical Considerations: http://behsan.ajums.ac.ir/ webdocument/ load.action? webdocument_ code= 1000&masterCode= 33004722. Funding/Support: The financial support was provided by Ahvaz Jundishapur University of Medical Sciences, Vice Chancellor for Research and Technology. 1. Carvalho B, Cohen SE, Lipman SS, Fuller A, Mathusamy AD, Macario A. Patient preferences for anesthesia outcomes associated with cesarean delivery. Anesth Analg. 2005;101(4):1182-7. table of contents. doi: 10.1213/01.ane.0000167774.36833.99. [PubMed: 16192541]. 2. Arroyo-Novoa CM, Figueroa-Ramos MI, Miaskowski C, Padilla G, Paul SM, Rodriguez-Ortiz P, et al. Efficacy of small doses of ketamine with morphine to decrease procedural pain responses during open wound care. Clin J Pain. 2011;27(7):561-6. doi: 10.1097/AJP.0b013e318211936a. [PubMed: 21436683]. 3. Moore A, Costello J, Wieczorek P, Shah V, Taddio A, Carvalho JC. Gabapentin improves postcesarean delivery pain management: A randomized, placebo-controlled trial. Anesth Analg. 2011;112(1):167-73. doi: 10.1213/ANE.0b013e3181fdf5ee. [PubMed: 21081764]. 4. Faiz HR, Rahimzadeh P, Visnjevac O, Behzadi B, Ghodraty MR, Nader ND. Intravenous acetaminophen is superior to ketamine for postoperative pain after abdominal hysterectomy: Results of a prospective, randomized, double-blind, multicenter clinical trial. J Pain Res. 2014;7:65-70. doi: 10.2147/JPR.S53234. [PubMed: 24465135]. [PubMed Central: PMC3900330]. 5. Imani F. Postoperative pain management. Anesth Pain Med. 2011;1(1):6-7. doi: 10.5812/kowsar.22287523.1810. [PubMed: 25729647]. [PubMed Central: PMC4335751]. 6. Faiz SHR, Alebouyeh MR, Derakhshan P, Imani F, Rahimzadeh P, Ghaderi Ashtiani M. Comparison of ultrasound-guided posterior transversus abdominis plane block and lateral transversus abdominis plane block for postoperative pain management in patients undergoing cesarean section: A randomized double-blind clinical trial study. J Pain Res. 2018;11:5-9. doi: 10.2147/JPR.S146970. [PubMed: 29296094]. [PubMed Central: PMC5741073]. 7. Asnaashari M, Safavi N. Application of low level lasers in dentistry (endodontic). J Lasers Med Sci. 2013;4(2):57-66. [PubMed: 25606308]. [PubMed Central: PMC4281979]. 8. Jackson RF, Roche G, Mangione T. Low-level laser therapy effectiveness for reducing pain after breast augmentation. Am J Cosmet Surg. 2009;26(3):144-8. doi: 10.1177/074880680902600303. 9. Herascu N, Velciu B, Calin M, Savastru D, Talianu C. Low-level laser therapy (LLLT) efficacy in post-operative wounds. Photomed Laser Surg. 2005;23(1):70-3. doi: 10.1089/pho.2005.23.70. [PubMed: 15782037]. 10. Hashmi JT, Huang YY, Osmani BZ, Sharma SK, Naeser MA, Hamblin MR. Role of low-level laser therapy in neurorehabilitation. PM R. 2010;2(12 Suppl 2):S292-305. doi: 10.1016/j.pmrj.2010.10.013. [PubMed: 21172691]. [PubMed Central: PMC3065857]. 11. Ivandic BT, Ivandic T. Low-level laser therapy improves vision in patients with age-related macular degeneration. Photomed Laser Surg. 2008;26(3):241-5. doi: 10.1089/pho.2007.2132. [PubMed: 18588438]. 12. Tuby H, Maltz L, Oron U. Induction of autologous mesenchymal stem cells in the bone marrow by low-level laser therapy has profound beneficial effects on the infarcted rat heart. Lasers Surg Med. 2011;43(5):401-9. doi: 10.1002/lsm.21063. [PubMed: 21674545]. 13. Rhee CK, He P, Jung JY, Ahn JC, Chung PS, Suh MW. Effect of low-level laser therapy on cochlear hair cell recovery after gentamicin-induced ototoxicity. Lasers Med Sci. 2012;27(5):987-92. doi: 10.1007/s10103-011-1028-5. [PubMed: 22138884]. 14. Prabhu V, Rao SB, Chandra S, Kumar P, Rao L, Guddattu V, et al. Spectroscopic and histological evaluation of wound healing progression following low level laser therapy (LLLT). J Biophotonics. 2012;5(2):168-84. doi: 10.1002/jbio.201100089. [PubMed: 22174176]. 15. Carvalho RL, Alcantara PS, Kamamoto F, Cressoni MD, Casarotto RA. Effects of low-level laser therapy on pain and scar formation after inguinal herniation surgery: A randomized controlled single-blind study. Photomed Laser Surg. 2010;28(3):417-22. doi: 10.1089/pho.2009.2548. [PubMed: 19821701]. 16. Hegedus B, Viharos L, Gervain M, Galfi M. The effect of low-level laser in knee osteoarthritis: A double-blind, randomized, placebo-controlled trial. Photomed Laser Surg. 2009;27(4):577-84. doi: 10.1089/pho.2008.2297. [PubMed: 19530911]. [PubMed Central: PMC2957068]. 17. Jang H, Lee H. Meta-analysis of pain relief effects by laser irradiation on joint areas. Photomed Laser Surg. 2012;30(8):405-17. doi: 10.1089/pho.2012.3240. [PubMed: 22747309]. [PubMed Central: PMC3412059]. 18. Nesioonpour S, Mokmeli S, Vojdani S, Mohtadi A, Akhondzadeh R, Behaeen K, et al. The effect of low-level laser on postoperative pain after tibial fracture surgery: A double-blind controlled randomized clinical trial. Anesth Pain Med. 2014;4(3). e17350. doi: 10.5812/aapm.17350. [PubMed: 25237637]. [PubMed Central: PMC4165037]. 19. Bjordal JM, Bensadoun RJ, Tuner J, Frigo L, Gjerde K, Lopes-Martins RA. A systematic review with meta-analysis of the effect of low-level laser therapy (LLLT) in cancer therapy-induced oral mucositis. Support Care Cancer. 2011;19(8):1069-77. doi: 10.1007/s00520-011-1202-0. [PubMed: 21660670]. 20. Moore KC, Hira N, Cruikshank JA. The effect of infra-red diode laser irradiation on the duration and severity of postoperative pain: A double blind trial. Laser Therapy. 1992;4(4):145-9. doi: 10.5978/islsm.4_92-OR-16. 21. Kreisler MB, Haj HA, Noroozi N, Willershausen B. Efficacy of low level laser therapy in reducing postoperative pain after endodontic surgery-- A randomized double blind clinical study. Int J Oral Maxillofac Surg. 2004;33(1):38-41. doi: 10.1054/ijom.2002.0449. [PubMed: 14758818]. 22. Bjordal JM, Lopes-Martins RA, Joensen J, Couppe C, Ljunggren AE, Stergioulas A, et al. A systematic review with procedural assessments and meta-analysis of low level laser therapy in lateral elbow tendinopathy (tennis elbow). BMC Musculoskelet Disord. 2008;9:75. doi: 10.1186/1471-2474-9-75. [PubMed: 18510742]. [PubMed Central: PMC2442599]. 23. Ribeiro AS, Salles PR, da Silva TA, Mesquita RA. A review of the nonsurgical treatment of oral leukoplakia. Int J Dent. 2010;2010:186018. doi: 10.1155/2010/186018. [PubMed: 20339486]. [PubMed Central: PMC2836849]. 24. Avci P, Nyame TT, Gupta GK, Sadasivam M, Hamblin MR. Low-level laser therapy for fat layer reduction: A comprehensive review. Lasers Surg Med. 2013;45(6):349-57. doi: 10.1002/lsm.22153. [PubMed: 23749426]. [PubMed Central: PMC3769994]. 25. Bjordal JM, Johnson MI, Iversen V, Aimbire F, Lopes-Martins RA. Low-level laser therapy in acute pain: A systematic review of possible mechanisms of action and clinical effects in randomized placebo-controlled trials. Photomed Laser Surg. 2006;24(2):158-68. doi: 10.1089/pho.2006.24.158. [PubMed: 16706694].